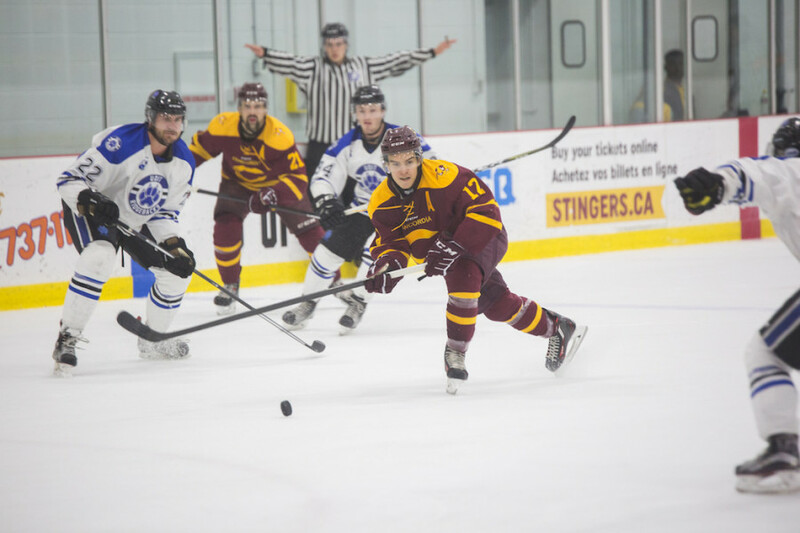 The Concordia Stingers men’s hockey team seemed set to snap an ugly series of losses early in the game against the Ottawa Gee Gee’s. Despite missing head coach Marc-Andre Element who was serving a two-game suspension, the Stingers looked deadly to start the game. Things were physical from puck drop in the fourth and final meeting between the two teams this season. Despite Ottawa’s best efforts, their hits failed to slow down rookie speedster Massimo Carozza. Less than three minutes into the game’s opening frame, the young forward blew past defenders and passed the puck to the U Sports point leader Anthony Beauregard. A signature Beauregard deke and cross crease pass later and Carozza buried a tap in goal to put the Stingers up by one. The rest of the period looked like the Stingers at their best. The maroon and gold put up chance after chance, keeping Ottawa goaltender Graham Hunt on his toes. Forward Raphael Lafontaine would finally bury one of the many chances on a rebound from a heavy shot from Stingers defender Carl Neill. Heading into the second 2-0, the Stingers looked to be in complete control. Penalties and an anemic powerplay slowed the Stingers down in the second. The usually high emotion, high intensity team seemed flat and emotionless. A less than encouraging sign with playoffs set to begin in just two weeks. In the dying minutes of the third, a barrage of power plays and chances for the Gee Gee’s manifested itself into a goal to end the second 2-1 with the momentum heavily favouring the Gee Gee’s. The third was worse if anything for the Stingers. No player seemed able to bury the chances that were created and any powerplay that they got seemed to do more harm than good. Three minutes into the final period, Ottawa forward Connor Sills scored to tie the game. From that point on it was a series of missteps and communication errors by the Stingers who couldn’t find a way to answer Ottawa. When they received the gift of a powerplay in the final five minutes after a vicious crosscheck from behind on one of their own, it seemed as if the team may have a chance to redeem themselves. Instead the result was a shorthanded breakaway, the game winning goal from Ottawa and the fourth Stingers loss in the last five games. The Stingers will attempt to get back on track before the playoffs Saturday, Feb. 3 against the Royal Military College Paladins, a team fighting for their playoff lives.